What works on a PC without internet connection nowadays? Our life is so much dependent on the internet in the recent times that we are online even while on the go that is, on our smartphones. But, what happens when there is no internet connection or there is a disruption in the network? We are in a fix all of a sudden and feel utter helpless in such situations. Most of the applications presently are dependent on an active internet network and so is the case with most of the Dictionaries. While there are plenty of Dictionaries available online that can be downloaded for PC, most of them either require an internet connection or there is a fee attached to them. Even though you may get a free dictionary, it may not possess the full range of features and lack most of the words. 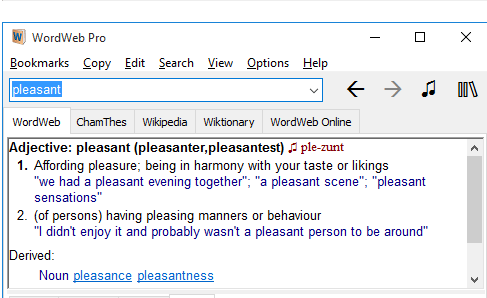 In such cases having a fully featured dictionary on your PC which can be accessed offline and is free of cost too, is a great alternative for many. Today in this post, we have compiled a list of best offline dictionary for PC which will be helpful for that quick word search. They will not only provide you instant solution without any internet or Wi-Fi connection, but will also help you with a comprehensive data base that has almost all the words that you can think of. So let’s get going..
Wordweb is one of the finest dictionary software available in the recent times which is absolutely free of charge. You can download the complete edition without any cost that offers a huge database of source words which is about 15000 in number. Not just that, using its translator service is equally convenient as it provides you with the word translation in just one simple click even when you are offline. The application remains in the system files and can be started from any of the computer programs. For MS Word, Wordweb is embedded in it by default and can be accessed with just one click from the Word file itself. Wordweb not only defines the words that you are looking for, but also displays synonyms, analogous words and the source of the words. While Wordweb offers a compelling pro version and a free version with limited features, the free software is being used by abundance of people across the world as not many are unable to bear the costs of a premium dictionary. Wordweb offers over 150000 source words and synonym combinations over 120000 in number with regular updates and additions on international words (English). 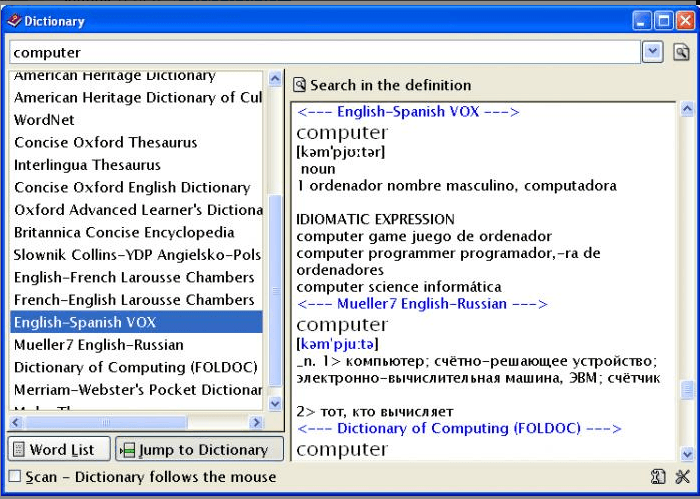 Ultimate Dictionary is a free software for desktop (Windows) that is as easy to use, as it is to install. It offers an exhaustive collection (close to 61) of dictionaries which includes word choices for languages like, English, French, Polish and Spanish along with glossaries, dictionaries and thesauruses. Being a compilation of almost all the information that you need related to a word, this program provides you an all-round solution for your queries. It helps you to find your information for a word search in just one lookup from all the 61 dictionaries at once. When you are looking for a words meaning and enter into the search box of the tool, it searches for the same in all the 61 dictionaries that it features all at once and displays the definition pulled up from each dictionary where the word was traced in the pane on the right. As you enter the word with the cues the solution starts getting shown on the pane. This dictionary offers an uncomplicated, organized and user-friendly interface, and helps compare various dictionary descriptions smoothly. Ultimate Dictionary also controls the dictionaries effortlessly using the administration tools like that lets you add , omit, or even rearrange dictionaries. Moreover, it also recognizes the format used by Stardict Dictionary. TheSage is an exhaustive and a 100% free professional Dictionary and Thesaurus that is also available offline for PC users. It consists of a huge dictionary that includes over 210,000 word meanings along with a comprehensive thesaurus that offers more than 140,000 links among definitions that consists of synonyms, hypernyms, holonyms, antonyms, hyponyms etc. Its interface includes tabs that let you find numerous words simultaneously using appropriate and exceptional search tools viz. wildcards and more. You can also retrieve the history of the words that you have looked up for. The best part about the software is that it assimilates into the context list of the Windows that helps you to be able to find definitions from practically any source from your PC. While with The Sage you have the permission to use online sources such as, from Google or from Wikipedia, you can also have access to the huge collection that already contains usage illustrations of around 50,000. It also lets you use other online search options like, real-time search, anagram search and permission to use services like, system tray assimilation and the skill to run program through a USB drive. The Sage also includes more than 70,000 phonetic notations. 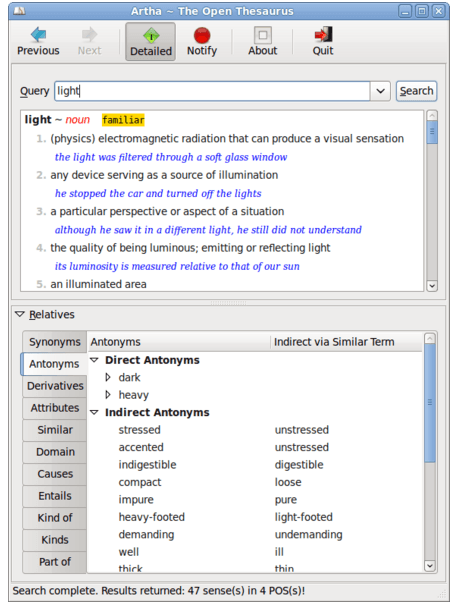 Some of the other features that sets it apart from other programs are its ability to find information from most of the applications in just one click, providing a definite thesaurus for individual definition, any of the words can be clicked upon starting a fresh search, works perfectly even when run via a portable device like a USB, offers clipboard function that lets you copy the look up results, definitions, examples, etc., allows you to customize with choice of colors and fonts, lets you browse its list real-time, reminds you of the word you are looking for with its assistant tool, works as a speaking dictionary and also lets you save the words from different sources. Lingopad is an offline dictionary that is available for use on Windows PC and is perfect for those who are looking for a fantastic German to English glossary. Not just that it also offers a host of other dictionaries in different languages like, French, Turkish, Spanish, Norwegian, Italian, Arabic and Japanese. It allows you to import your own set of terminologies, specify your own, build word stocks and even edit them, and use them alongside the current dictionaries. It’s absolutely free of cost to download with no hidden charges. Using the search functionality you can look for the start, middle or the last part of a word look up for collocation and look at the index of the recently searched words. You can also press a hotkey on your PC to look up for a word that is tagged or a copied word, however, if you want to search for words on Wikipedia or Google there are direct links for the same. Note that LingoPad is currently available only for Windows OS and there is no other update expected for this program for Windows soon. However, LingoPad is apparently planning to create a program for Mac OS X, Windows and Linux which will be multi-platform. Stardict is an open source free cross-platform offline global dictionary that accommodates over 100 free dictionaries currently. While you have access to this huge database of dictionaries for free, you have to install each of these dictionaries after you have downloaded the crust of the Stardict dictionary. It has come up with new engaging ideas for example, Fuzz query that reminds you of how to spell a word correctly when you are unable to recall the same. It gives you the matching results that are closest to the word that you entered, after it has figured out the correlation amid two words using the Levenshtein Edit Distance tool. You just need to add “/” prior to your entered word and then hit the Enter button to develop a fuzzy query. Net Dict is another new offering from the program that does not require you to install a dictionary to your PC. You can simply click on the icon on the top right end of the pane which is the main menu and select the option that says Preferences. This will allow you to set the Net Dict feature from here which you can begin using after you sign up and log into your account. This will now let you use the Net Dict feature with your own dictionaries. While the full-text translation option lets you translate from one language to another by clicking on the icon on the left hand corner that says “text translate” and using the different search engines such as, Excite Janpan translation, Yahoo, Google, you can also get the words using the mouse for translation by clicking on the “Scan” button. Search results are shown at the tooltip during the scan mode that allows you to find the desired words extremely conveniently. In conjunction with Freedict, it provides approximate translations of any website in foreign language. This program is available for Windows, Maemo, Solaris and Linux at the moment. Artha is multi-platform Thesaurus in English that is offered absolutely free of cost and is available for only offline use. The program is built on WordNet which contains a huge lingual database of English created at the University of Princeton. Every word that you search on this software will pull up possible related words that comprises of, synonyms, antonyms, similar words, entails, domain words, derivatives, attributes, causes, hypernyms etc. that’s called sense-mapping. All these links point direct you to the interpretation and illustration of the analogous category and when you choose a correlated word in the software, it automatically takes you to the analogous definition that is highlighted for better understanding. As soon as you start typing, Artha shows up an index of probable match words based on whatever you have entered so far. Also, in case you enter a word with incorrect spelling the program suggests some close matches. Arha remains in the system tray of the computer after you have downloaded it. It helps you to search words from any of the open windows by choosing the text and by pressing the already fixed hot-key. You can elect to have Artha display a passive alert while using the hot-key or you can also choose to have the program show a balloon tip which will help you to quickly proceed with your current action. Additionally, Artha keeps a record of all your word search history and equips you with buttons like, “Previous” and “Next” in order for you to browse through your look ups conveniently. 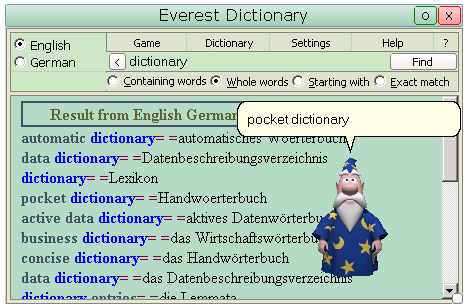 Those who are looking for a free offline dictionary for their PC, Everest can be just the right solution for them. Till now there are 35 dictionaries that are available under this program and claims to keep adding more dictionaries from time to time. 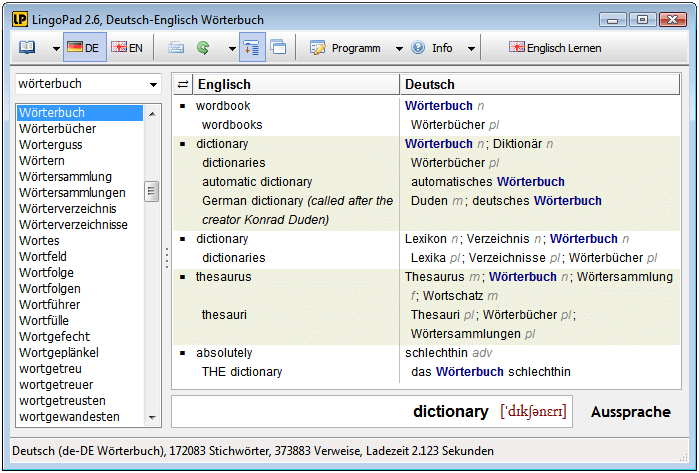 While it allows you to search words across many dictionaries, one of its striking features is that it keeps a watch on the clipboard which allows you to start the automatic look up of the term in the dictionary during the use of any program by simply copying the word to the clipboard with the help of the command “Copy”. Everest offers results for all chief European languages and also helps you find the terms using the index. The application comes attached with a speech aid that helps you to pronounce the words correctly in addition to the responsive feature. Moreover, it also allows to customize words, initiates automatic look up on double-clicking the term, displays a Back button that helps you to go back to the earlier interpretation, shows one random new word on a small pane for learning purpose, allows you to customize word colors, lets you test your knowledge, translates various languages, allows you to build your own dictionary, share and translate them to your buddies, and even control your favored websites. Aard Dictionary is an open source and free cross-platform offline dictionary that offers word solutions in multiple languages. It comes along with a dictionary module that allows you to look up for search terms in the dictionary along with a quick search from Wikipedia even while you are offline. You need to download the software just once and you are all set. Aard offers a wide range of dictionaries which are available in several languages on their website that contains a Wikipedia index in different languages like, English, Portuguese, Spanish, French, Italian and many more. Other databases offered by the program are WikiQuote, WordNet, Wiktionary, etc. Moreover, it allows you to include over fifty different dictionaries to its directory, offers great new features like, on-the-fly search and filtering options, the ability to look at the recent look ups or a history, enables you to zoom in and out of the result page, and quick word search. The terms that you have found on Wikipedia using the program are displayed in form of an entire article which you can save in the HTML format on your preferred hard disk. You also have access to many shortcuts on the keyboard with Aard which is for those people who rather prefer using the keyboard and not the mouse for navigation. Well, tinySpell is more of a spellchecker than a traditional dictionary and is absolutely free of cost. This program can be especially useful for those who refer to a dictionary to check the correct spelling of a word instead of a spellchecker. It is a really handy tool for all as it also comes along with an American to English Dictionary featuring over 110,000 terms. It can keep a watch on your typing skills in progress and notify you whenever it finds a word that has been spelt incorrectly. Not just that, it also runs a quick spelling check on the text that is being copied to the clipboard, and can also get auto installed in the taskbar notification section for easy reach. tinySpell is a compact tool that lets you analyze your text in any Windows program and spot correct it quickly and effortlessly. So when you simply need to run a quick spellcheck on your text, but do not want to get into the hassle of starting the word processor that is when you can use the quick and efficient tinySpell. In short, it is one of the most needed tools in your system task bar for those who write frequently.